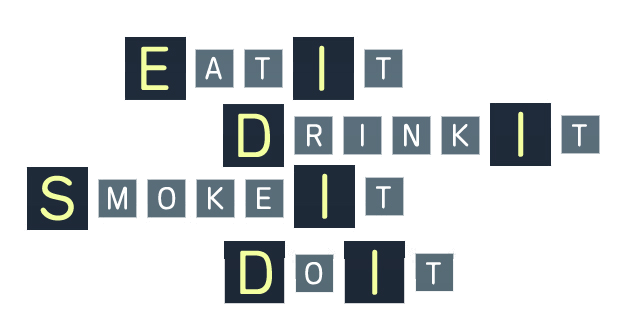 EAT IT, DRINK IT, SMOKE IT, DO IT! The Game is the first Trivial board game specially designed for the sophomoric humor that fits you. Friends and families enjoy hours of fun playing board games; and now it’s your turn to have that kind of fun withyour group of friends and party enthusiasts without the family oriented slant on the theme of the game. This game doesn’t require the players to eat, drink, smoke or do anything (except have fun guessing how to categorize objects). A card is drawn, a word or phrase is read by a player and then you guess if what was read can be eaten, drank, smoked or done (an activity performed). If your answer is correct points are awarded and a simple roll of the die advances your playing piece towards the end of the board. Beware, correct answers win points, wrong answers take points away. Award segments are given for each category; one for guessing eat it, one for smoke it and so on. Players start on 69 and advance their way to the end of the board at zero. The first player to reach the end of the board is declared the winner! You will find out about these during gameplay. Rest assured, they are named IMPoSsIBlE QuESTionS for a reason. Thanks for playing - enjoy!